Make sure you know what resin your board is made with. There are 2 types Polyester or Epoxy. We make both types of repair kits. Remove all moisture, loose particles and dirt from the repair area. Rough sand the surrounding area to allow resin a secure bond. In the shade, apply the needed amount of Sun Cure™ to the repair with an application stick. Make sure to work out any air bubbles and form the resin to the repair. Make sure resin has completely hardened before removing the plastic coversheet or sanding. Sun Cure™ has a tack-free surface that will allow an easy sand finish. Which Repair Kit to Use? Estimate needed resin and mix in hardener. Stir resin until Q-CELL is completely saturated. Apply mixture to the repair. Resin and hardener, fiberglass, masking tape, sandpaper, cover sheet, mixing cups, mixing sticks, and plastic gloves. Dry and clean fracture, light sand the area about 1/4” around the fracture. Cut or grind away any broken fibers to create a void to be filled. For larger fractures requiring cloth laminations, size and cut cloth before mixing resin. For taping flat surface and rail dings, tape around the sanded area to prevent resin form spreading. Nose and tail dings require taping under one side to mate the shape of the missing piece – multiple pieces of tape might be needed. Although the resin mixture will be thick, the tape will hold the resin in place around the broken or fractured part and will act as a mold eliminating extensive sanding and shaping. For mixing, first estimate the amount of resin needed to fill the ding. Use scissors and chop thin pieces of cloth, (about 1/8” pieces) and add to the resin. The cloth will make the resin very workable and will provide needed strength. Using an adequate mixing cup, estimate resin and add hardener. Once mixed, slowly stir the chopped cloth into the resin (don’t add too much). To apply resin on flat surfaces and rail dings, use a mixing stick and work out any air bubbles. A plastic or wax paper cover sheet is applied over the surface of the repair to mold a smooth surface. On rail dings, tape down each end of the cover sheet to hold it in place. Do not remove the cover sheet until the resin has completely hardened. Check the hardening progress by looking at the leftover resin in your mixing cup. Once dry, slowly peel off the cover sheet. If sanding is needed, start by using a medium grit sandpaper. Keep the sanding surface flat and avoid excessive, uneven sanding. Following initial sanding, use fine (wet/dry) sandpaper. To match a gloss finish, polish the repair after wet sanding. Delamination is when fiberglass cloth becomes separated from the foam on your board and occurs mainly where your feet apply pressure to the board’s surface. Gather your materials and tools: resin and hardener, drill with 1/8” bit, wax paper, weight (slightly larger than repair area) and a Ding All® Delamination Repair Bottle. Prepare your board. Remove all wax and dirt. Drill two holes at opposite ends of the repair. Squeeze all of the moisture out of the repair and lay the board flat. Mix: Estimate enough resin to fill less than half of the delamination. Pour the resin into the bottle, add hardener, replace cap and shake. Apply the resin by squeezing into each hole leaving room for compression. Place wax paper over the top of the repair and add weight to flatten. Once dry, remove the weight and wax paper. If resin leaked out, sand the area. Replacing or repairing a fin begins with having the proper materials on hand – especially while traveling. 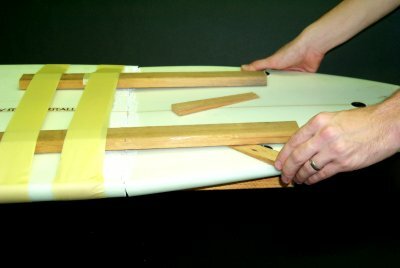 Knowledge of repairing fins can salvage a surf trip! If a fin has stress cracks that have not broken through, or is not loose, do not attempt to repair it. First, gather your tools and materials: resin and hardener, fiberglass cloth, fin rope, masking tape, sandpaper, rubber or plastic gloves, acetone, spare fins. If needed: mixing cups, mixing sticks, scissors, sanding wheel or sander, paint brush, hot glue gun – optional (note: some tools may be substituted by hand tools). Preparation: broken fins require grinding or removing any broken fibers to the foam to provide a void to be replace by a new layer of fin rope and cloth. Once the particles are removed, clean and sand the surrounding surface. Apply masking tape around the sanded edges of the repair to prevent excess resin buildup. Align the fin by matching it to the opposite fin. Trailing fins are set straight and stand vertical. Once aligned, the fin must be taped in place. Apply a piece of masking tape across the top of the fin and attach to each rail while holding the fin in place. Adjust by pulling on tape. Each damaged side of a fin must be replaced by one piece of fin rope, extending 1” past the front and back, and two oval patches of 4 or 6 ounce cloth covering the base and side of the fin. Cut the second patch larger to overlap the first patch when applied. To apply, in one step, mix the estimated amount of resin and saturate the fin rope. Use gloves and squeeze excess resin out. Then, apply along the base of the fin. Place the first fiberglass patch over the fin rope, overlapping the base and the side of the fin and brush on resin. Once saturated, apply the second patch to overlap the first and brush on resin. Sanding: Once dry, follow sanding instructions. The use of a foam backed sanding wheel quickens this step. Monitor the strength of the repair during sanding, weak areas might need to be recovered with more layers of cloth. 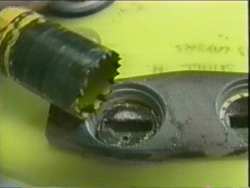 Similar to repair, replacing fins begins with a flat surface. First, remove any broken fibers with a sanding wheel. Clean and sand the repair surface. Use filler (Q-CELL or Fiberglass Filler) and fill any holes. Let dry and sand flat. Align the fins to be tacked on. Place a mark where the front and back of the fin should be (Note: refer to opposite fin or similar board for alignment). Tack the fin in place by using a hot glue gun or Ding All® Quik Stik™. If tacking with resin apply tape across the top of fin and attach to each rail to hold in place once resin is applied. Once tacked in place, repeat the same preparation and glassing process in the broken fin section above. Gather your tools and materials: resin and hardener, fiberglass cloth, tape, plastic gloves, squeegee, acetone, mixing cup, mixing sticks, filler, sander (flat or disc), scissors, 4 wood splints 20” long 1“x 2”, paint brush, saw horse or equivalent. Preparation: both broken ends must be cleaned free of dirt wax and moisture. Place the largest section horizontally and attach the four splints with masking tape – two on the top and two on the bottom. Position each splint half way over the break and space each about 12 to 14 inches apart. 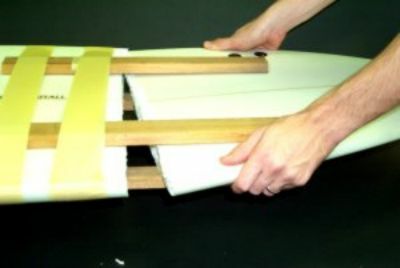 The splints will guide and hold the broken pieces while being tacked together (Note: the splints might need to be wedged to match the surfboard’s rocker). Apply: mix enough filler to tack the boards together filling any voids. With the splints attached to the largest section, place board vertical, apply filler resin and slide into the broken piece. If possible keep the board vertical while drying. When dry, remove the splints and place the board horizontal. The second application will be filling the open cracks on both sides. Fill all cracks even with the surface and apply a cover sheet if possible. If any sections of cloth are torn off, take this time to replace them. After both sides are filled, rough sand surface flat and prepare four pieces of cloth – two bottom layers 6 to 8 inches wide overlapping the rails and two top layers 10 to 12 inches wide overlapping the bottom layer and both rails. Prepare enough laminating resin to coat one side at a time using a paint brush or squeegee. Work out all excess resin and let each side dry before repeating on opposite sides. Upon completion of laminations brush on a coat of sanding resin and refer to information on fin replacement and repair for sanding instructions. The Fin Control System® is designed with safety in mind, in most cases a collision between your surfboard and body can result in damage to your surfboard and sometimes injury to yourself. Using the Fin Control System the chances of this happening are reduced. The fin has tabs that are engineered to break off in most collisions, therefore, causing no damage to the surfboard and reducing the chances of injury. If this occurs, undo grub screws, turn the surfboard upside down and lightly tap over the broken fin – the tabs will fall out – (a freeing agent can be used), then simply replace the fin and go surfing! 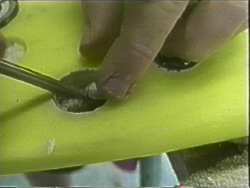 If, however, there is damage to your Fin Control Plug in the surfboard, follow these steps. Gather your materials and tools: 1 1/8”(30mm) holesaw, drill, resin and hardener,fiberglass powder,replacement FCS plug, repair jig (this can be made out of a 2“x4” piece of 1/2” plywood), spare FCS fin,and tape. Make repair jig by drilling 1 1/8” hole through the center of the 1/2” plywood. This will be used to keep the hole saw straight while drilling out the damaged plug. 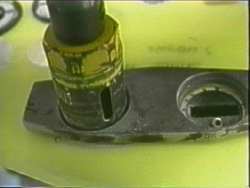 Install the new Fin Control Plug on the tab of a fin and tighten. (Don’t forget to clean the plugs with acetone before installation). Insert into hole and second plug. Make sure the plug stoppers are flush with the bottom of the board. If repair hole is very large, first fill cavity with Q-CELL/resin and sand flat. Note: Do not let Q-CELL/resin set for a long time before refitting the Fin Control Plug. This will ensure that the boring of the hole with Q-CELL/resin is not to difficult. Tape off area around the plug. Let the plug harden and then remove the spare fin jig. Turn the screw so it is below the surface of the plug and begin sanding. Use 60 -80 grit to take down the rough part then continue with finer grits. Repair cracks around Fin Control Plugs in the same manner, but if the crack is very small, scratch up with a sharp instrument and fill with Q-CELL/resin.